This ink is no longer manufactured. And any preorder is accepted on an if/when basis. 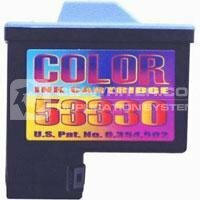 CD/DVD Printer Ink Cartridges are a specialty of ours. Providing authentic ink solutions for over 10 years from manufacturers such as Primera, Microboards, Epson, Rimage and many more, you can buy with confidence here. Usually despatched within 4 working days. If you need these inks fast please upgrade to next day delivery. PRIMERA . Bravo . 2 . XR . INK . COLOUR . 53330 . Primera .